Gary Hamilton has defended his team’s record run of draws and urged detractors to look beyond the black and white of results and analyse the in-play incidents. Glenavon visit a Ballinamallard United side this weekend that can share the honour of fewest draws in the Danske Bank Premiership - stark contrast to the Lurgan Blues’ league tally of eight from 17 fixtures. However, Hamilton is refusing to add to the sense of frustration at diminished returns by putting unnecessary focus on events he considers beyond the control of the club. 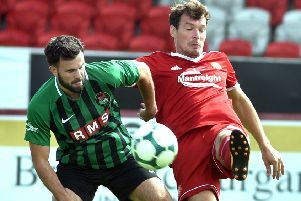 “In the first match with Glentoran we were denied a penalty, we then had two calls turned down against Dungannon Swifts and another two shouts go against us in the Crusaders fixture,” said Glenavon manager Hamilton. “We were 2-0 up against Coleraine then had a goal disallowed. “We hold up our hands for the draws with Linfield and Carrick Rangers but in five or six games, including last weekend, we feel we have been impacted by situations we cannot control. “It is not about having a go at match officials but it is also not just about the results. “We, as a management team, analyse our games and look at the bigger picture. Kick-off on Saturday will be 3 o’clock away to Ballinamallard United.